Japanese version of this post is also available. The 2nd topic in the series, “Rethinking ScrapBook’s Browser Context Menu”. This time, I kick around the [Capture Frame] menu which apprears with [Capture Page] when we click in a frame / inner-frame. 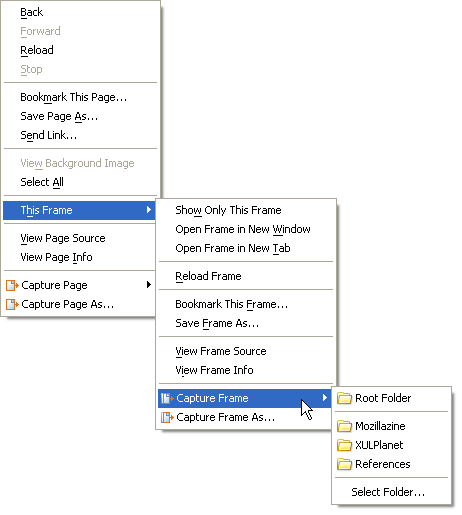 In the Firefox’s standart context menu, all menus related to frame are submenus inside the [This Frame] menu. Hence [Capture Frame] should be inside the [This Frame] menu in a similar way. Additional menus of extensions should not scatter and should be placed in one place. 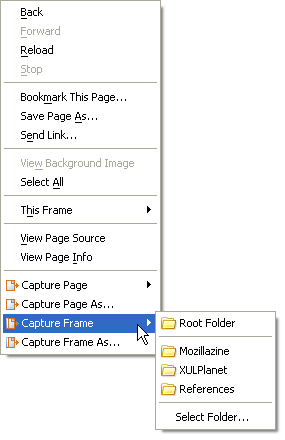 It is easier to choice between [Capture Page] and [Capture Frame]. As a developer, I have a following viewpoint. [Capture Frame] inside [This Frame] is surely sensible, however, I’m afraid some people mistakenly thought that [Capture Frame] was gone! Please let me hear your thoghts or comments. Current: [Capture Frame] and [Capture Page] are in parallel position. Alternative: [Capture Frame] should be the submenus inside [This Frame]. Really? I will release ScrapBook 1.2.0.4 without any loading of Changelog page ASAP. The idea is logical and makes sense BUT the current setup, having capture_frame and capture_page in parallel, is best from the UI(user interface) perspective. I agree with the “rule of thumb” which says that an extension’s additional menu elements should all be grouped together rather than being popped in all over the place. This coherency makes it a lot easier for users to find the command/option they need. I agree with the “rule of thumbs” mentioned by ipre. Just submitted this as a feature request. IMO “capture frame” shall never b in “This Frame” submenu but near to “Capture Page” instead — just because arranging *by functions* and not “by areas where it func. may b applicable” 😉 is more functional. is it possible to set scrapbook such that the default is not to save images? right now, everytime i capture a page, the save images and save styles boxes are automatically checked. most of the time I don’t want to save images but only the style, and have to uncheck the save images box every time. and because of this, i can’t turn off the ‘capture detail’ notification. just a minor nitpick, would be great if it can be resolved. love the extension otherwise, can’t live without it! thanks! Per the capture folder… I would like the date in YYYY MM DD format automatically appended as a prefix to the file name I’m saving. That way I can quickly see the date I saved the web page.